All stroganoffs have one thing in common: sour-cream gravy. 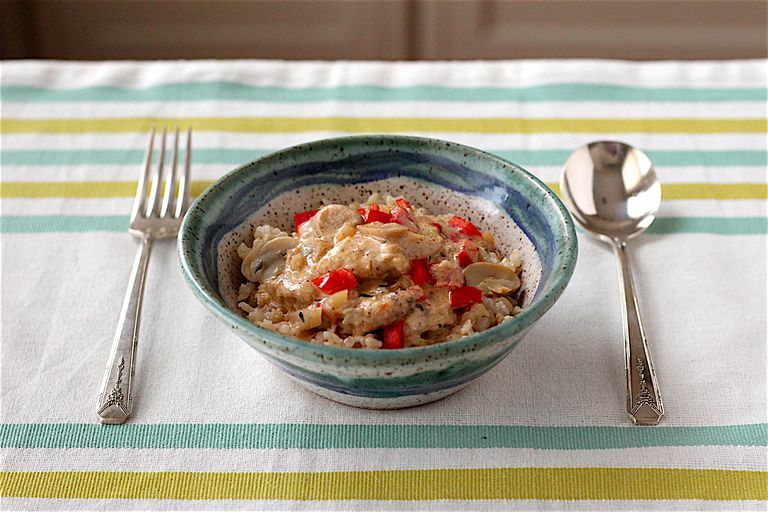 Now that lactose-free sour cream is available in some markets, even people who must avoid lactose as part of a low-FODMAP diet can enjoy this old-fashioned, stovetop meal. To keep it low FODMAP, be sure to use canned mushrooms, which are lower in FODMAPs than fresh ones, and choose a reduced sodium chicken broth that does not contain onions or garlic. Progresso reduced-sodium chicken broth is one that fits the bill. In a shallow dish, stir together the sorghum flour, salt, pepper, and thyme. Dredge the sliced chicken in the flour mixture. In a large skillet with a tight-fitting lid, heat 1 tablespoon of the oil over medium heat until fragrant. Reserve 1/4 cup of the red pepper for a garnish and sauté the rest with the fennel for about five minutes. Transfer the sautéed vegetables to a medium bowl. Measure the second tablespoon of oil into the middle of the skillet and roll the skillet to distribute it. Add the chicken to the skillet; reserving the extra flour from the dredging dish. Brown the chicken on both sides, about 15 minutes. Scrape the bottom of the skillet with the spatula as you turn the chicken, so you don't lose the crust. Return the sautéed peppers and fennel to the pan. Add the mushrooms, Worcestershire sauce, and chicken broth. Cover the skillet, bring it up to a simmer, then adjust heat to simmer gently for 45 minutes. Add the extra flour mixture and simmer until the gravy is thickened, 2-3 minutes. Turn off the heat, stir in the sour cream and mustard, and serve immediately over rice, garnished with the extra chopped red pepper. If you aren't able to find lactose-free sour cream, consider using regular, full-fat sour cream if you think you can handle a little lactose, and stick to just one serving of the recipe, which will have just 1 1/2 tablespoons of sour cream in it and probably less than 1 gram of lactose. To make this recipe gluten-free, use a gluten-free brand of Worcestershire sauce. The secret to tender chicken is keeping this stew cooking at a simmer, not a boil. Adjust the heat as needed during each step of cooking to prevent boiling, which will toughen the chicken. If your budget permits, purchase your chicken as chicken tenders or cutlets, to save a step during the preparation of this recipe. If you will be preparing brown rice to go with this meal, start it when you are about to begin sautéing the vegetables. If the rice finishes cooking a few minutes before the stroganoff is ready, simply turn the heat off, leave the pot covered, and fluff the rice just before serving.